Flight of Beer Samples ~ From left to right: Parrish Street Pale Ale, Pratt Pilsner, Bull's IPA, & Youngen Horny Barley Wine. 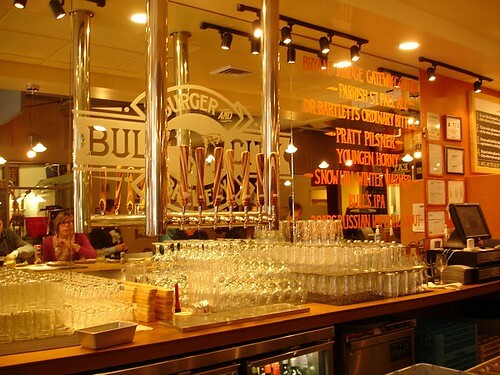 Bull City Burger & Brewery in Durham is celebrating its one year anniverary this month. To help them celebrate they are holding another “find the golden bull” contest like the one they did to mark their grand opening back in March 2011. The owner has hidden 5 small golden bull figures around Durham. Each day they post a clue about where they are hidden. If you find one of the golden bulls you win a free burger a week for the next year! You read the contest clues and rules here. Sadly, I have yet to eat one of their burgers but I hear they are fantastic. They use locally sourced meat that is hormone and antibiotic free. They also brew their own beer onsite and serve up some incredible “dirty” fries. 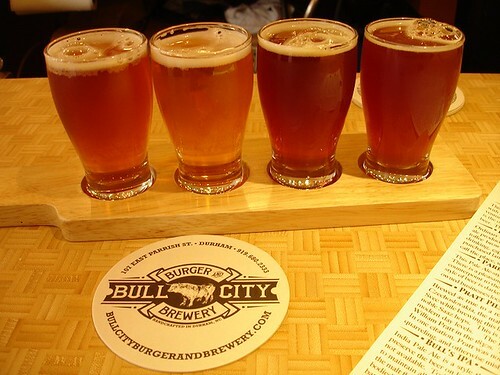 I stopped in Bull City to sample some of their beers (pictured above). You can sample 3 or more of their beers for just $1 each and full pints are only $4.22. 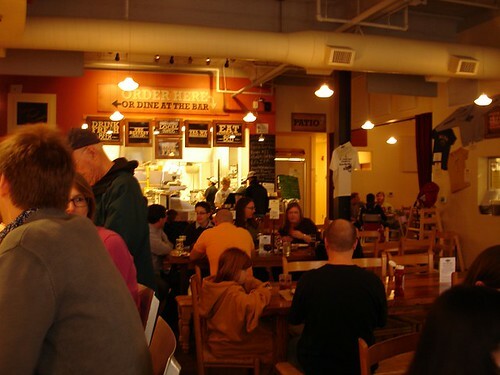 Seasting consists of chairs at the bar and large community tables on the main floor where groups can sit together. You place your order at the counter and are given a number to display on your table and a server will bring you your food. Bull City Burger has been well received by the burger loving crowd and plays a strong role in the ongoing revitalization of downtown Durham. To learn more about the menu and beer offerings check out their website and facebook page. Check back here soon for a full review of their burgers as I plan to eat there early next month and get some additional photos!